The Horror Section: We're Just Here For The Bad Guys. After creating a lot of buzz at this year’s Slamdance festival (the indie fest that runs parallel to Sundance) The Dirties had its Canadian premiere during the opening weekend of Fantasia. Film geeks Matt & Owen (director Matthew Johnson & Owen Williams) are in the process of making a student film about exacting revenge on their school bullies, when Matt suggests they take things further. 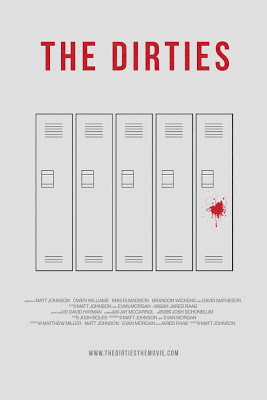 The Dirties is not the kind of film I usually talk about around here, but I’m making an exception because I want to support it. This is not just because it’s a local production – bullying is most certainly not specific to Canada – but also an extremely effective and poignant one. The logical knee-jerk reaction to hearing that someone has made a comedy featuring a school shooting is “how could they?”, or perhaps more aptly “how dare they?” However, after seeing it, I now realize this is the only way this tale could’ve been told successfully. The Dirties focuses on the cause of the action, not the effect, and with the culture of bullying becoming more and more prevalent in the news these days, it only serves to make this movie all that more important. 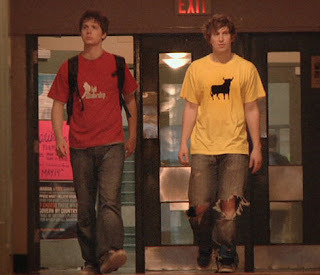 Matthew Johnson (right) & Owen Williams as Matt & Owen in The Dirties. Considering the seriousness of the subject matter, it’s extremely impressive to me that Johnson & company were able to make this type of film without it seeming exploitative or over-dramatic. It was also very smart to not portray the two main characters as anti-social monsters, but rather two outwardly normal kids enduring daily torment at the hands of their peers. I don’t want to get on a soapbox here, and I certainly don’t condone gun violence, but what I am saying is I’m very proud of Johnson & company for tackling this subject the way that they did. As with yesterday’s film, The Battery, there was an incredibly natural rapport between the two leads. Matt & Owen are clearly best buds, so as they near the end of their “film” and the gap between them starts to widen, the uneasiness is magnified, much like living through the high school experience can be. There is palpable tension built toward the end, as we wonder if Matt, this previously jovial and passionate student, will actually go through with the unthinkable. Now that Kevin Smith has put his name behind The Dirties (he went so far as to champion it at Comic-Con last week) as part of his Movie Club, which tours select films around North America, it may actually enjoy some sort of release. I urge you to see it when it does.